distribution Statewide, lacking records only in four far eastern counties, though likely present in all 100 counties. abundance Very common (to locally abundant) across the state, except less numerous in the eastern Coastal Plain. Seemingly rare in counties surrounding Albemarle Sound, and perhaps absent on the Outer Banks. One of the most abundant odonates in the mountain province. flight Early April to late October in the Coastal Plain; late April or early May to early October in the Piedmont, and to late September in the mountains. habitat A wide variety of stream habitats, but most common along small forested streams. behavior Where present, easily seen flitting slowly amid vegetation close to a stream, usually in shade or in small openings inside a forest. 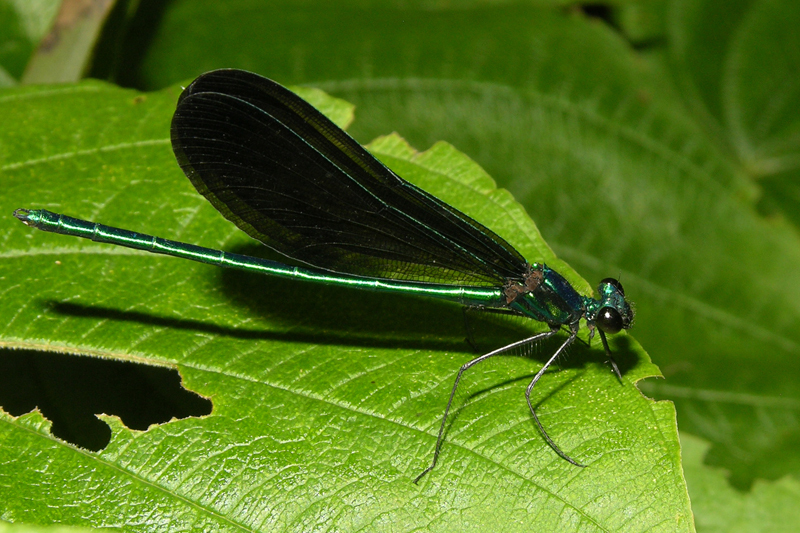 comments This is, by far, our most commonly seen member of the Family Calopterygidae (Broad-winged Damsels), and it is also one of the most obvious and easily identified of all of our damselflies.